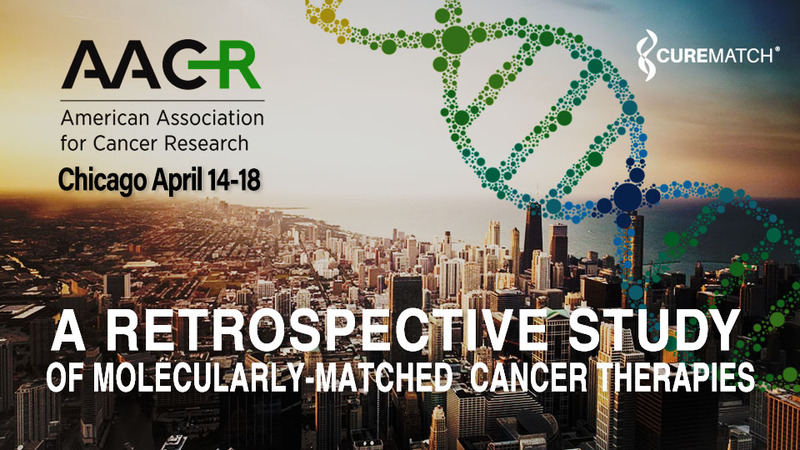 SAN DIEGO, CA – April 13, 2018 – CureMatch, Inc. announces the presentation of new data showcasing advances in Precision Oncology at the American Association for Cancer Research (AACR) Annual Meeting in Chicago from April 14-18. 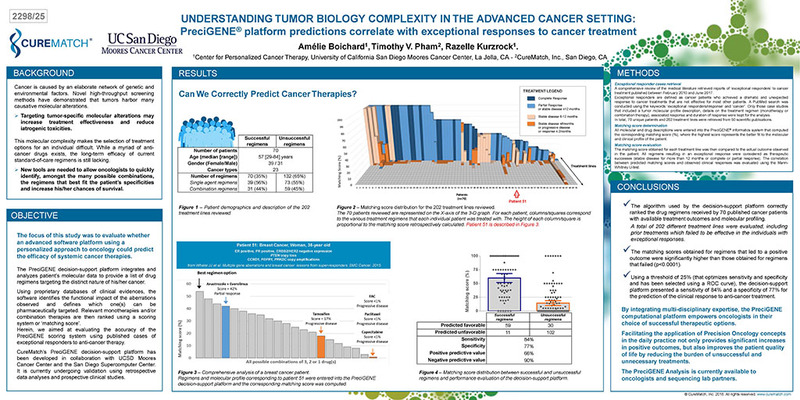 The poster, titled ‘Understanding tumor biology complexity in the advanced cancer setting: PreciGENE® platform predictions correlate with exceptional responses to cancer treatment’ will be presented by Amelie Boichard, Pharm.D, Ph.D and Stephane Richard, Ph.D, on Monday, April 16, 1:00PM CDT, during the ‘New Software for Data Analysis’ session. This study highlights the possible benefits of an evidence-based selection of personalized therapy options in terms of patient response, and validates the data mining methods and optimized algorithms used by the CureMatch PreciGENE® therapeutic decision-support system. The authors performed a retrospective analysis on published data of 70 cancer patients whose tumors were profiled by DNA sequencing or other molecular assay(s) and who received a total of 202 treatment lines. These patients presented an exceptional treatment response to at least one drug regimen. The CureMatch platform ranked all treatment regimens (both successful and unsuccessful) using the PreciGENE Score, reflecting the degree to which a therapy or combination of therapies matches a patient’s biomarker profile. The results revealed that the matching scores obtained for regimens that led to a positive outcome were significantly higher than those obtained for regimens that failed. The PreciGENE decision-support system predicted correctly the response to treatment in almost 80% of the cases (161 out of 202 regimens). The PreciGENE® therapeutic decision-support system is the result of a sponsored collaboration between CureMatch Inc., UC San Diego and the San Diego Super-Computer Center. The platform has been optimized using molecular profiles clinically reviewed during weekly pluri-disciplinary meetings (tumor boards) at the UCSD Center for Personalized Cancer Therapy, and is currently tested in several prospective and retrospective validation studies. The abstract details for this retrospective study can be viewed here, and if you are attending the AACR 2018 conference, please connect with us to discuss the future of precision oncology. UPDATE: AACR published the CureMatch abstract in their Journal, Cancer Research. You may view the published abstract online here and the poster is shown below (click it to view an enlarged PDF version). The American Association for Cancer Research (AACR) journal Cancer Research publishes original studies, reviews, and opinion pieces offering significance and broad impact to a diverse audience. Cancer Research seeks manuscripts that offer pathobiological and translational impact to inform the personal, clinical, and societal problems posed by cancer. The main scope of the journal is captured in its primary subsections: Genome and Epigenome, Metabolism and Chemical Biology, Molecular Cell Biology, Tumor Biology and Immunology, Translational Science, Convergence and Technologies, and Population and Prevention Science. CureMatch, Inc. is a digital precision oncology company bridging the gap between legacy cancer treatments and advances in personalized medicine. CureMatch scores and ranks Personalized Combination Therapy® options to target specific molecular aberrations in cost-effective PreciGENE® reports. This actionable intelligence guides oncologists to effectively customize treatment for each individual patient. Based in San Diego, CA, the CureMatch technology has expert foundation in supercomputing, oncology, genetics, molecular and cell biology. The CureMatch intelligent computing system assists oncologists with the daunting task of selecting the most promising combinations of anticancer drugs for each patient. Utilizing proprietary algorithms to analyze over 4.5 million combinations of commonly used as well as newly approved cancer treatments found in massive pharmacological and clinical databases, CureMatch scores and ranks Personalized Combination Therapy® options to target specific molecular aberrations and improve the precision of cancer treatment recommendations. Download a PreciGENE Sample Analysis.